For the last six months or so I’ve been pondering the assertions made by the Campaign for York, that the city centre of York would be killed, would die, if further expansion of the out-of-town retail at Monks Cross was approved. This has led to thoughts of the deserted medieval villages (DMVs) and other abandoned settlements which are dotted around the country. Here’s a photo of the abandoned site at Cottam, where a ruined brick church (19th century apparently) stands alone in the middle of a bumpy field, once filled with houses. 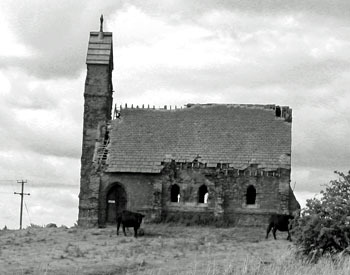 Wharram Percy is of course the most famous ‘DMV’. Those who oppose the expansion of out-of-town retail, and specifically the most recent plans, seem genuinely concerned that the ‘centre’ of the city will shift. That the new John Lewis store will become the new heart of the community, and pull everything towards it. The drawings of the new store suggest is rather cathedral-like in its vast bulk. And it does appear to have many devotees/worshippers. So perhaps the future will see Stonegate and Shambles all in ruins, eventually bumps under grass, and the Minster an empty shell, like the churches at Cottam and Wharram, as a new settlement forms around the community stadium and John Lewis. Or maybe not. By Lisa @YorkStories • 28 June 2012 Beyond York To link to this page's proper location please use the > permalink.